Only $35 for four-course experience! Link to Filet & Lobster Only $35 for four-course experience! Sign up for Club Fondue for a surprise in April! Available All Month of April! This is no joke! Enjoy a four-course experience with an entrée of Filet Mignon & Lobster for only $35 per person! Treat your family to a kid-friendly meal with mystifying magic from 6-9 pm at your table side. Prepare to be delighted and entertained at Magical Family Evenings. Treat your family to a kid-friendly meal with mystifying magic from 6-9 p.m. at your tableside. Choose from the regular Melting Pot menu or feast on our four-course Special Family Menu. All magic is complimentary. Join us for our Spring Cleaning Bag Swap. Bring 2 bags and pick one "new to you" bag. All extra bags will be donated to a local Women's Shelter. Join us for our Spring Cleaning Bag Swap. Bring 2 bags and pick one "new to you" bag. All extra bags will be donated to a local Women's Shelter. Then enjoy a four-course experience with your girlfriends for only $29.95 per person! Hop into The Melting Pot on Easter Sunday for a fondue experience that every family member will enjoy. We will be open from 11:00 am. Spend your time hunting eggs this Easter instead of cooking over a hot stove. Spend your time hunting eggs this Easter instead of cooking over a hot stove. Hop into The Melting Pot on Easter Sunday for a fondue experience that every family member will enjoy. Choose from 1, 2, 3 or 4 courses from our regular menu. Did you know our chocolate covered strawberries are available to take home? Perfect way to surprise a loved one today. Pre-Order your berries by calling 918-299-8000. Did you know our chocolate covered strawberries are available to take home? Perfect way to celebrate your graduates big day. Pre-Order your berries by calling 918-299-8000. We are proud to offer gluten-free, vegetarian & vegan options, including our new delicious Vegan Cheese and Chocolate Fondues! Please let us know upon making your reservation of any food allergies and sensitivities. At The Melting Pot, Sunday Funday is any Sunday before a Monday Holiday. Enjoy a Sunday Fundue Feast for only $29.95 per person (and only $19.95 per child under 12). A Monday off deserves a Sunday night out! At The Melting Pot, Sunday Funday is any Sunday before a Monday Holiday. Enjoy a Sunday Fundue Feast for only $29.95 per person (and only $19.95 per child under 12). Your four-course Fundue Feast will include your choice of cheese fondue, fresh salad, chef’s special entree, and your choice of decadent chocolate fondue. Make your reservation today! Treat your date to an extra special meal on an extra special night! Join us for a set three-course fondue dinner before prom and we’ll include soft drink, tax and tip to keep things simple. Receive a complimentary box of chocolate wafers per person to enjoy later! Treat your date to an extra special meal on an extra special night! Join us for a set three-course fondue dinner before prom and we’ll include soft drink, tax and tip to keep things simple. Receive a complimentary box of chocolate wafer per person to enjoy later! Reservations are required. Get your weekend off to a delicious start. You’ll find indulgences like French Toast Fondue and alongside savory favorites like our Alpine Benedict Fondue and Avocado Fiesta Toast. And, what’s brunch without bottomless mimosas? Book a table today. A time to remember. A time for family. 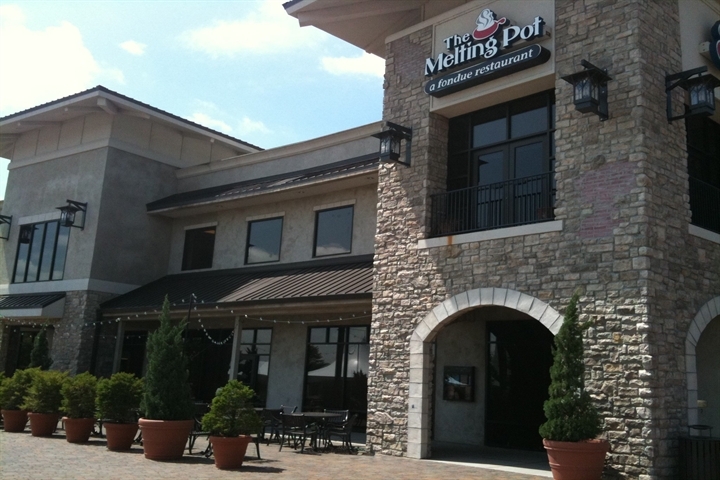 The Melting Pot of Tulsa will be closed this Memorial Day.